Quandl is a great provider of various types of data that can be easily integrated with R. I wanted to play with the available data and see what kind of insights can be gathered using R.
I wrote a short script that collects British Pound Sterling (GBP) to Polish Złoty (PLN) historic exchange rates from 1996 till today (4th September 2015). Then I downloaded the exchange rates data from Quandl. Data can be downloaded in several popular formats (i.e. ts, xts, or zoo), each appropriate for different packages. Once I collected my data, I started cleaning the data frame that was downloaded from Quandl. The column names designating High and Low Rates had whitespaces in them, and that could cause all sorts of problems in R. I removed ‘High_est’ and ‘Low_est’ from the xts data to make plotting with dygraphs easier. Thanks for lubridate package I easily extracted years, months, and days from the Date field. I also added a ‘Volatility’ column that showed the difference between the High and Low rates. Now I had all my data cleaned so I could start plotting. I started by shamelessly copying the code for the Reuters-like plot that was included in Quandl’s cheat sheet. The results can be seen underneath. 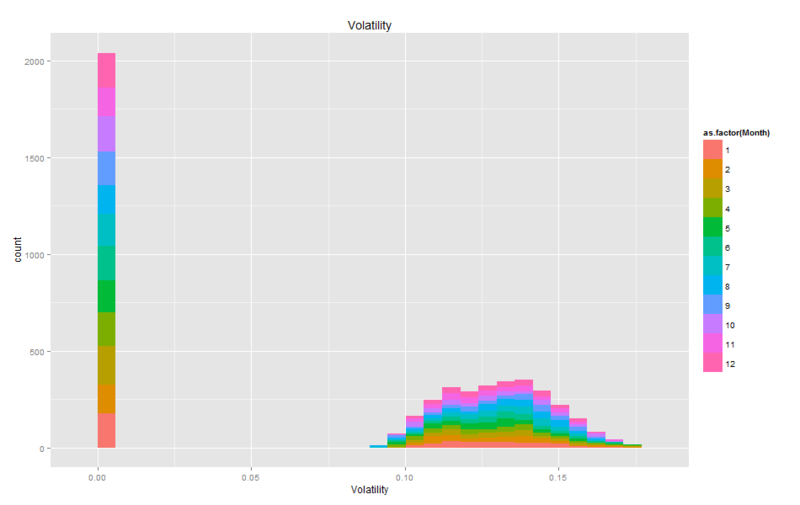 Volatility histogram shows clearly that there are many fields with missing values. Comparing the blank fields with those containing non-zero values showed that the number of blank vs. non-blank is almost the same. 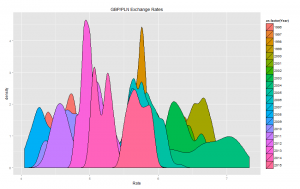 This means that Volatility should not be used as it has a high number of missing values. 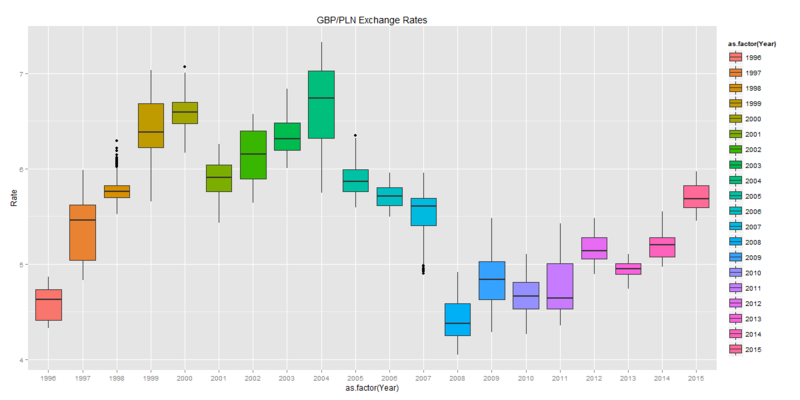 The box plots show how the GBP/PLN exchange rates fluctuate across different years and months. 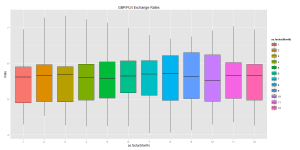 They also include the mean values and the variation in the exchange rates. Last, but not least was the interactive plot created with dygraph package. That’s definitely my favourite as it allows fine-grained analysis of the underlying information (including date range selection). 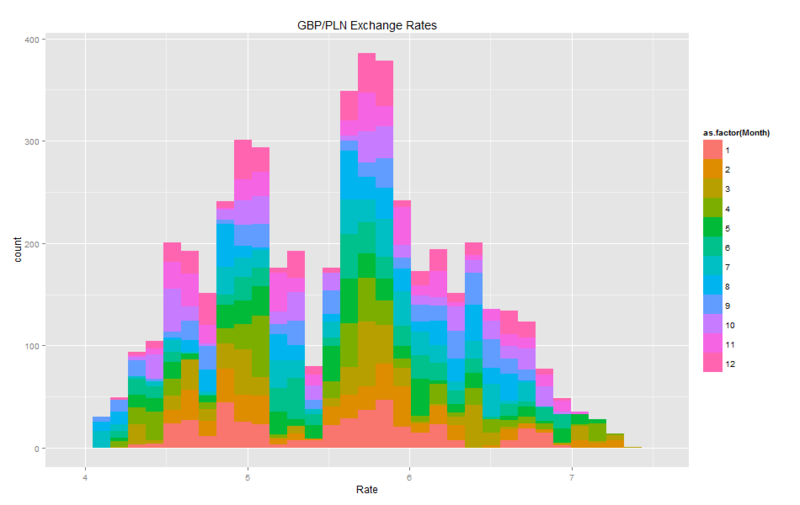 I added the event lines that seemed to be relevant to the the observed maximum and minimum values of the GBP/PLN exchange rates. Around the time when Poland joined the EU, the GBP/PLN exchange rate peaked at 7.3 PLN. Four years later, just before Lehman Brothers went bankrupt, Pound Sterling was valued as low as 4.07 PLN. 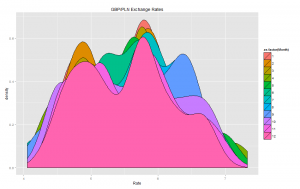 I thought that I had enough simple plots and now was the right time for more complicated analyses. 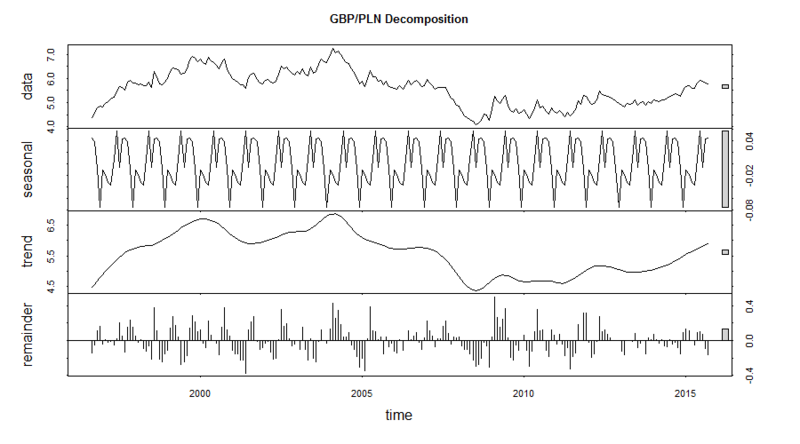 I started with the Seasonal Decomposition of Time Series by Loess using the stl function. Seasonal, trend and irregular components were extracted from the underlying data. The main trend is showing the appreciation of GBP against PLN but the seasonal component might be (?) indicating approaching correction of that trend. 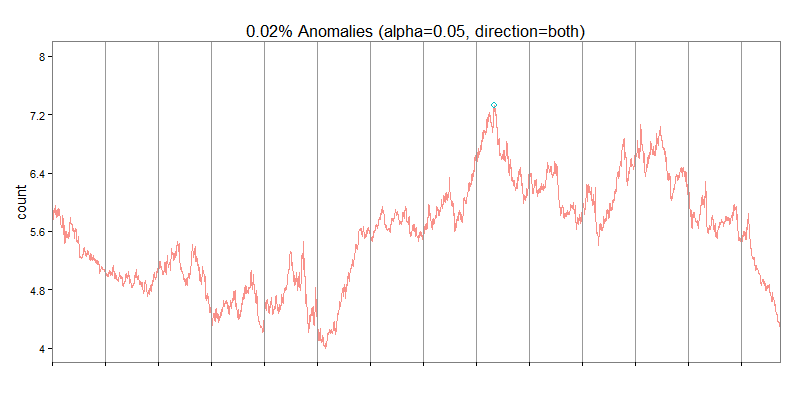 I wanted to finish the analysis with applying the Anomaly Detection package, that was released by Twitter’s engineering team, to my data collected from Quandl. My plan was to see whether there were any anomalous changes of the exchange rate during the recorded period. Running this code resulted in obtaining one anomalous value, i.e. 7.328 PLN, which was the maximum value observed in the collected time series. I hope that you enjoyed this walkthrough. 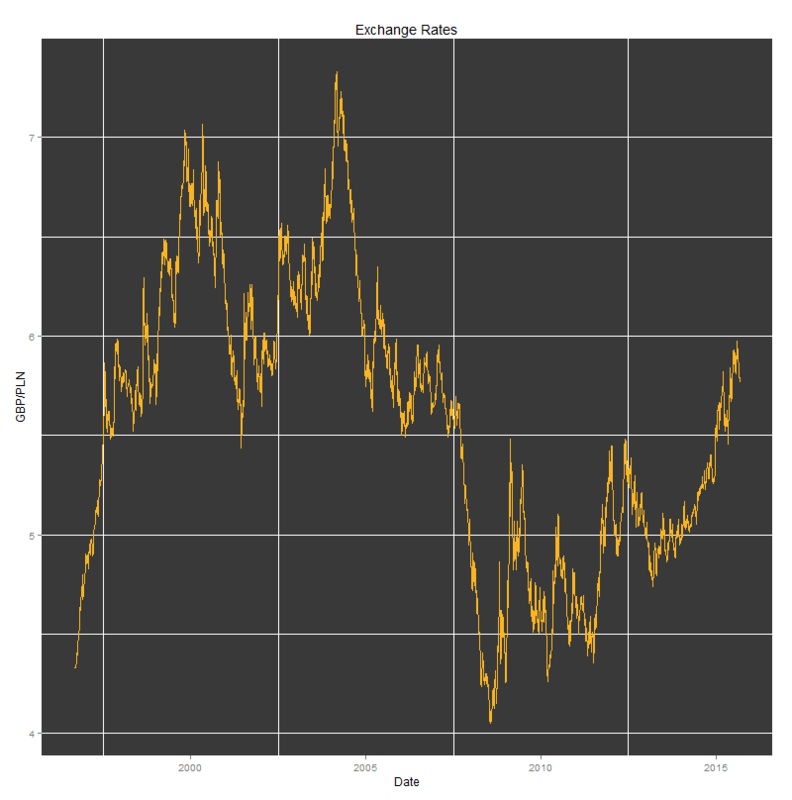 In future posts I want to descibe more ways to analyse time series.